Whether you’re in need of a vehicle to transport your employees to a special event or to take your family on a Summer vacation, we offer the highest quality passenger vehicle rentals. Now offering 12-24+ capacity vehicle rentals (CDL and Non-CDL units available). All of our rentals are also available for sale, therefore our available rentals can often vary throughout the year. Contact our Rental Department for further information. A CDL is not required for any Sprinter rentals. We ask that you return the vehicle reasonably clean with a full tank of gas. 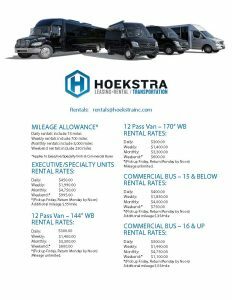 All Hoekstra rental vehicles are subject to State of Michigan laws and regulations. No open alcohol containers are permitted during use of the vehicle on the road.